NRG Stadium Hotel's Houston, Texas Location is BestThoughtfully positioned along Houston's Inner Loop, adjacent to NRG Sports & Entertainment Complex, less than two miles from Texas Medical Center and near downtown Houston and Hobby airports, the Crowne Plaza Houston - Medical Center offers guests a convenient central location.Boasting 60,000 square feet of unique meeting space and personal service by a Crowne Meetings Director, a two-hour RFP response guarantee and a Daily Meeting Debrief. Recognized for meeting service excellence, we go above and beyond your expectations, plus we're right next door to NRG Park.Houston visitors enjoy easy access to major medical and educational facilities, as well as popular area attractions. Spend the day in Houston Museum District, shopping at Galleria or Rice Village or visiting the Houston Zoo. 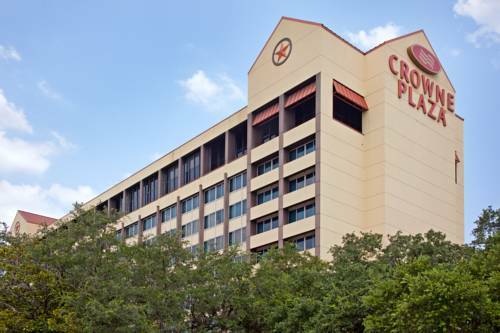 The Houston Livestock Show & Rodeo and the Offshore Technology Conference are held at NRG Park, just steps from our hotel's address in Houston.From the Crowne Plaza Sleep Advantage program to the 24-hour Fitness and Business Centers, two outdoor pools, a popular restaurant and free shuttle service within 3 miles, we provide upscale amenities to pamper our guests. With easy access to the Medical Center and NRG Stadium, our hotel's Houston, Texas location is perfect. We look forward to showing you a warm Texas welcome. Stetsons is a three meal restaurant featuring continental cuisine and a flavor of the Southwest. Offering full breakfast buffet or A La Carte every morning from from 6:30am to 10:30am, lunch from 11am until 2pm and dinner from 5pm until 10pm. Cattleman's Bar and Grill offers comfortable seating in our dining and lounge areas. Join us every day for Happy Hour for your favorite cocktails and appetizers open daily from 2pm to 11pm. After a busy workday or a full day of shopping, unwind with colleagues, friends or family at the Cattleman's Bar & Grille in our hotel's lobby. Guests in Houston, Texas can easily relax thanks to top-shelf cocktails and the comfortable environment. Flexible meeting space of three partitions opening up to the largetst ball room. At Meyerland Plaza you can shop, dine and enjoy over 50 exciting stores services and isconveniently located on Beechnut Street off Loop 610, Houston, Texas! Watch adventure from around the world at the Houston Museum of Natural Science's IMAX theater. Located in downtown Houston, Texas, the George R. Brown convention center is one of the city's largest and most recognizable building. Best known for Wedding Expo's, Gun Show, and many more. Located in Hermann Park, the Houston Zoo provides a fun, unique, and inspirational experience fostering appreciation, knowledge, and care for the natural world. More than 14 pulsating exhibits make the Children's Museum of Houston one of the top rated in the country. Packed with daily activities and invigorating performances, it s the place where minds come out to play! Space Center Houston, the official visitors center for NASA's Johnson Space Center, is the only place on earth where guests can embark on an out-of-this-world journey through human adventures in space.